If you're a fan of NARS multiples (and I for one am! ), then you're going to love this latest limited edition collection, Multiple Tints. 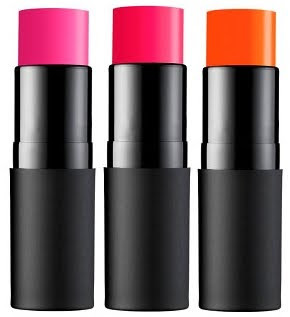 Unlike the previous NARS multiples, these three new colors are meant to be bright, yet lightweight tints, offering sheer color which can be worn on cheeks or lips. I treated myself to Turks and Caicos, (pictured far right), which is a bright orange/coral that brightened up my skin beautifully. Since this is a sheer formula, don't be alarmed by how bright these colors appear the tubes - they really are washes of color in pink, red and orange tones. The feel of the multiple was creamy, silky and light, and it was very easy to blend. The color, while sheer, lasted all day as well without melting or becoming oily. For those of you who want more color payoff, I recomend a few layers of the sheer tint, with a corresponding powder blush shade applied over it. Turks is a shade that will also work with most women's skin tones, particularly those with warm golden/yellow or orange undertones. I also loved the Turks shade for and change of pace on the lips. It provided the perfect amount of moisture for my lips throughout the day. Don't miss out on amazing Mother's Day deals at Drugstore.com!